This is very useful if you are not sure what size of display area you will have at each show or venue you to attend. 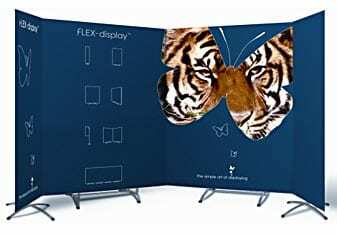 So with well thought out design, you can create a display which will always show the main message on the larger back panels and if space allows, you can use the system straight to show the full design. 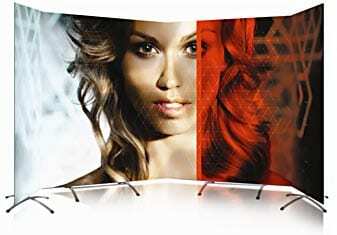 If space is tight, you can simply angle the outer displays either inwards or outwards to suit. 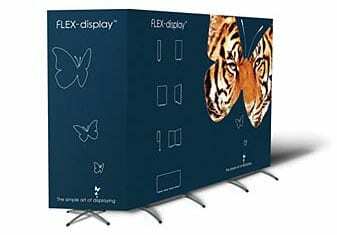 This can also be useful when trying to create a portable display booth for example as you can use the flexibility of the system to make partitions. Crossbase – Great for sections up to 80cm wide. Twinbase – Suitable for sections up to 120cm wide. Twinbase XL – Suitable for sections up to 150cm wide. Twinbase Mega – OK to support sections up to 2m wide. So as you can see, you can mix them to make a display exactly how you want it to be.